Our focus on maintaining high air quality in the Capay Valley is driven by the understanding of the direct connection between humans and nature. We all share the same air. To reduce emissions of air pollutants, the Tribe’s Fire Department fuels its vehicles with a biodiesel blend. Agricultural operations use two “clean diesel” tractors and other farming equipment to reduce emissions. 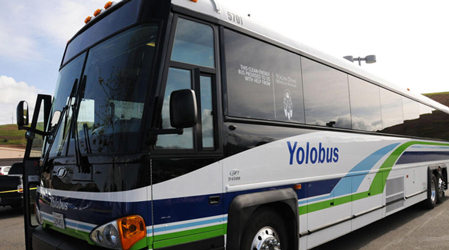 The Tribe provides Cache Creek Casino Resort employees with subsidized passes for Yolobus, which runs between Woodland and CCCR 17 times per day. The Tribe has also contributed directly to Yolobus to support the purchase and use of clean energy vehicles. To reduce the number of cars on the road, the Tribe encourages the use of ridesharing by providing six vanpools per day to areas not on the Yolobus route and by offering fuel discounts to employees that carpool. The solar array generates power with zero emissions and the fuel cells, which are powered by natural gas, produce energy efficiently and generate fewer emissions than most power sources. The Tribe brought a natural gas pipeline seven miles to the resort property, reducing truck traffic by up to ten propane tanker trucks per month and providing the fuel necessary to operate the fuel cells.